Andrea and Guido: Lake Tahoe Tomorrow! This weekend is planned for a little getaway. Andrea and Dan will be climbing in the Sugar Loaf / Lover's Leap area in El Dorado National forest and I'll take my time and my GS to get there "the long way". Click the image to get an interactive map on maps.google.com. This is the way I plan to take for getting there. I haven't decided how to go back but so far I think I'll just take the same route back. It's always different going the other way. And of course, the Givi Airflow windshield did not arrive in time. It's on the way with UPS snail transportation, probably as I was cheapo and got free shipping ... But that's how it is, nothing I can do against. I'll put the seat in the low position, ear plugs in and away I go. 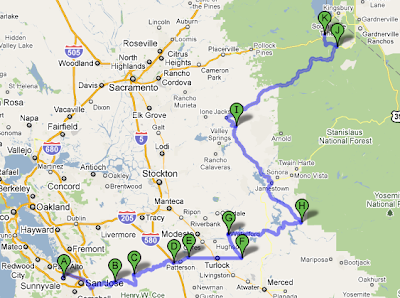 This will be the first longer trip on the R and the first longer trip for me on a motorcycle in some years. If Google is accurate and I take exactly this route it's a 616 mile round-trip in two days. We'll see how it works out. Looking forward to it. This will show pretty well which comfort changes I'll have to plan on the bike - so far I have only lower footpegs and the Adventure Winglets. Also, I have no hard cases, so I'll pack my Ortlieb Rackpack waterproof bag and put it on the backseat. That'll work for everything I might need during the day and Andrea can take the rest in the car. Unfortunately, I'm missing one thing: hard cases. Either top case or side cases would have been really helpful. I have all the stuff together not and will put it in my Ortlieb Packroll (the Rackpack is way too big).